Need extreme flexibility in positioning a camera, light or practically anything else within the 5.4 to 6.6 lbs (2.5 to 3kg) weight rating of these devices? A Magic Arm has for a very long time been the go-to solution for a huge number of photographers. A Magic Arm consists of, starting in the center, a large metal pivot joint with a large plastic locking knob or lever arm. Two substantially-thick metal arms measuring about 6" (150mm) attach to the pivot and freely rotate in 360° in a single axis. A metal ball socket is mounted on the end of each arm and a metal ball with standard Super Clamp stud rotates freely inside each socket, including in the single drop notch on each. The studs provide a 3/8" female thread on one end and 1/4" female threads on the other. Position the attachments as desired and the tighten the single locking knob/lever without great effort to make all moving parts of this extremely positionable accessory smoothly lock solidly into place at once. Attachments can be positioned immediately next to each other or up to 20.75" (527mm) apart (including studs). What those attachments are can be as diverse as your imagination and needs, but a Super Clamp mounted to at least one end is a very common choice. 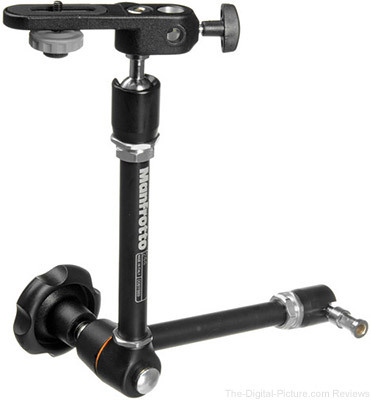 A camera platform such as the Manfrotto 143BKT is a common choice for mounting a camera and an adapter spigot provides direct attachment of items including a ball head. Magic Arms are available in a variety of kits that include clamps and mounting platforms. The Magic Arm provides far greater positioning versatility over the much smaller and lighter double ball joint, but if vibration is a concern, the DBJ has the definite advantage. I have, specifically, the Manfrotto 244N Variable Friction Magic Arm along with a variety of super clamps and attachments. It, or one similar, will let you get jobs done that would otherwise require far more effort. The price of this items seems quite reasonable to me considering its build quality and the value of its unique ability to position equipment with the utmost freedom.